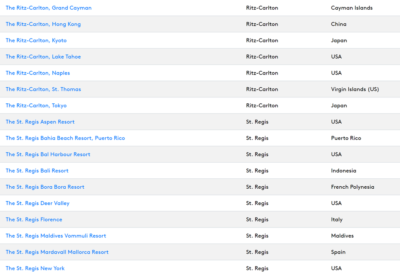 Which Marriott hotels are in Category 8? Which Marriott Rewards hotels should you book before January when Category 8 launches? 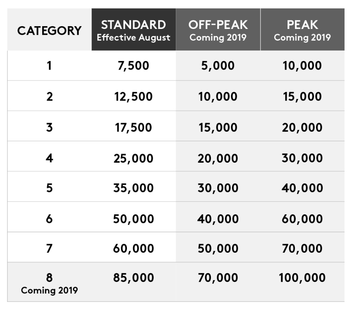 In early 2019, Marriott Rewards will add Category 8 to their current reward chart. This is what you should do before it happens. This is going to lead to a chunky 42% increase in the number of points needed to book these hotels as they rise from 60,000 points per night to 85,000 points per night for a ‘standard’ date. For bookings on a peak date (peak date pricing does not currently exist and also starts in January) you will see a crazy 67% increase in points needed. Rooms will rise from 60,000 points today to 100,000 points. I thought it would be useful to publish the full list of hotels moving into Category 8 next year. Click the text to enlarge – it is actually four separate images. It was not designed to be readable directly from the article! It is always difficult publishing tables on HFP because a lot of people read the site via mobile and they distort. If you still can’t read it, go to this page of marriott.com and sort the chart by category. The Category 8 hotels will be on top. What does this list mean in practice? If you had been planning on staying at any of the hotels on this list, you should book before Category 8 comes into effect. We expect this to be during January 2019. Your stay can be for any date up to 12 months ahead, so you are OK for the whole of 2019 if you leave your booking until late December 2018. You will make a substantial saving. It might be your only realistic chance to try, say, St Regis New York – a bargain at 60,000 points (cash rates are $1,100 + tax per night) but toppy at 85,000 points and exceptionally high at 100,000 points, which is what it will be when ‘peak rate’ pricing is introduced. The hotels in the charts above are a roll-call of some of the most famous hotels in the world. This is an amazing opportunity to try them out in 2019 for a relatively sensible (60,000) number of Marriott Rewards points. Can you still book Marriott hotels without having the points at the time of booking? I don’t see that as an option. Do you have to call to do it? 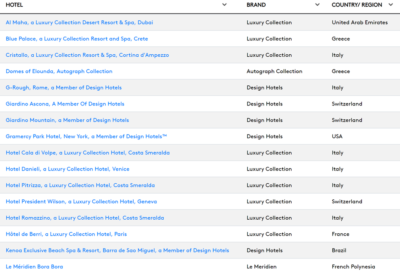 I barely have any points at the momeny due to Marriott losing 610k in the merger and the fact no points have posted from my SPG Amex since 1st July. So in theory one day I’ll get all these back. Not for those SPG properties. Yes if ex Marriott, no if ex Starwood. Will be interesting to see what they do for new properties. So far the only new one I have looked at is Westin – and that is being treated like an SPG. Filed a formal complain with AMEX SPG card for missing retention points after 20 days countless online chats and phone calls. Good. Hopefully you’ll get the same positive resolution that I did. Although it’s all well and good getting these points, they don’t actually transfer to Marriott/SPG anymore! Ian can you share any details of the resolution? They gave me a sizeable amount of points! They were intended to cover the loss of points ubsgoukd have received plus some to compensate me for the time wasted making calls and using Amex chat. What they didn’t do was correct the IT issue, so for the remainder of my 3 month double points period I continued to receive 1 extra point instead of 3. The size of the points deposit they gave me more than covered this however. So all was good. I’m in the same position getting 1 point instead of 3, as they’re not even turning up in the Marriott/SPG account yet I’ve decided to wait and deal with it all at the end of the 3 month period. 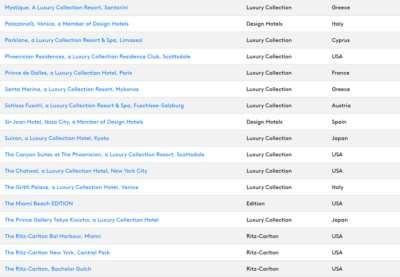 I have 22k spg amex points lost as well since mid August that say were sent but no trace of them. I have recently applied for the SPG Amex. I gave my SPG membership number. Do I need to merge it with my Marriott account? You no longer have an SPG account. You got a new 9 digit number on 18th August and strictly speaking you now have 2 Marriott accounts which need merging. Since SPG, Marriot and Ritz Carlton have merged and got one account altogether..
You will have your points under this one bucket to redeem. so just to confirm that when I added my SPG rewards number during my SPG AMEX application, that is OK.
my AMEX points will automatically get crdited to the combined Marriott-SPG account? Reading what you wrote, seems I need to now ring Amex again and give my Marriott a/c ? If you are waiting for points sent in the switch over period I guess those have fallen into the IT switch mayhem and may take some time to resolve. Your SPG account is now a Marriott account. If you have the old SPG number and not your new 9 digit SPG number it shouldn’t matter – it should all follow through. Starwood customer care told me that I needed to call Amex and give them my new number. They said the old numbers were dead despite the fact they still show on your account. All part of the disasterous IT merger! So just spoke with Amex and lodged a compalaint as well. Seems that Marriott have not told Amex the new account numbers and Amex won’t transfer until they receive them so if your account is sitting with your historical number than you may wait another month whilst this gets sorted. OT as no bits: At The Grain Store at London Gatwick, my two kids and I used the Priority pass as part of Amex Platinum. Bill was a little over £30 for all 3 of us and I settled it with my Platinum card. Now there is an extra £15 charge. I thought that even if 3 people ate, you didn’t have to pay per person as long as bill was under £30 and if above you’d settle the outstanding balance. Can someone shed light please. I am guessing the restaurant marked you down as 3 and therefore PP correctly charged you. You should have signed something for Priority Pass. You probably needed to be clear at the till to ask them to just use the two “credits” – they presumably put it through as three. DoubleTree by Hilton Hotel Sheffield Park has went up to 20000 from 10000. That’s a bit annoying when they are selling points 50% same time. That is very annoying, as I was banking on doing a few cheap points mattress runs there in December to keep Diamond! Good spot. Looks like John Lennon airport has also doubled to 20k. Does this mean there are no 10k redemptions left in the UK? On the points accruel later and booking before the end of December. It is important to both book and have sufficient points in your account otherwise when the new category 8 comes in you will find that your points requirment for the stay goes up. How do I know? I tried the same thing when the Grosvenor House in London went up from 45k to 60k. I did not have sufficient point in my account, and the points requirment went up to 60k! I cancelled! On the flip side, if you booked something and didn’t have the points at the time and its gone down would you need less points now? Of these hotels are the any recommendations for a family (2A 2C) redemption? I know about Domes in Crete but our there other good options? Thanks. One of the reasons I prefer Airline miles over hotel points is the complication redeeming for a family of 4. 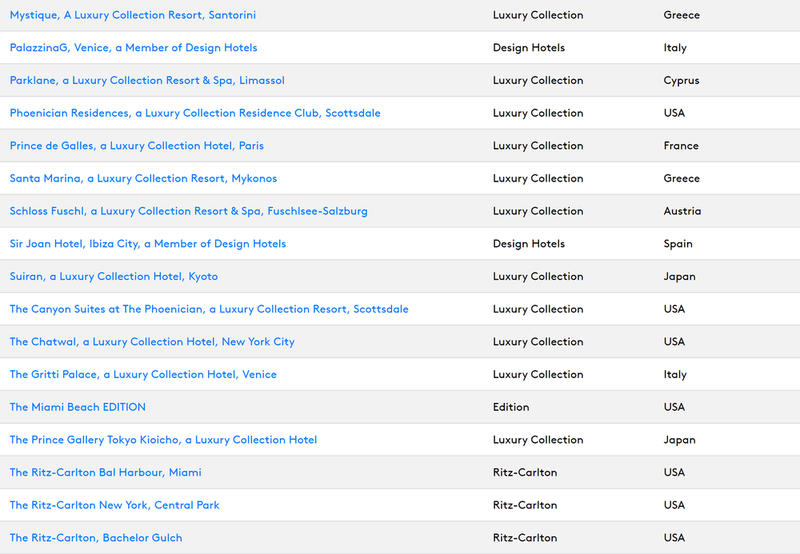 I’ll be happier when they finally get it set up for travel package certs to be able to be used to book SPG properties! But then there’s the difficulty of finding 4 reward seats. Do Marriott do 5th night free like Hilton? Never used Marriott points before but have plenty of MR I could use. Has anyone stayed at the ritz-carlton HK, or the st Regis Bali. Any feedback welcome. 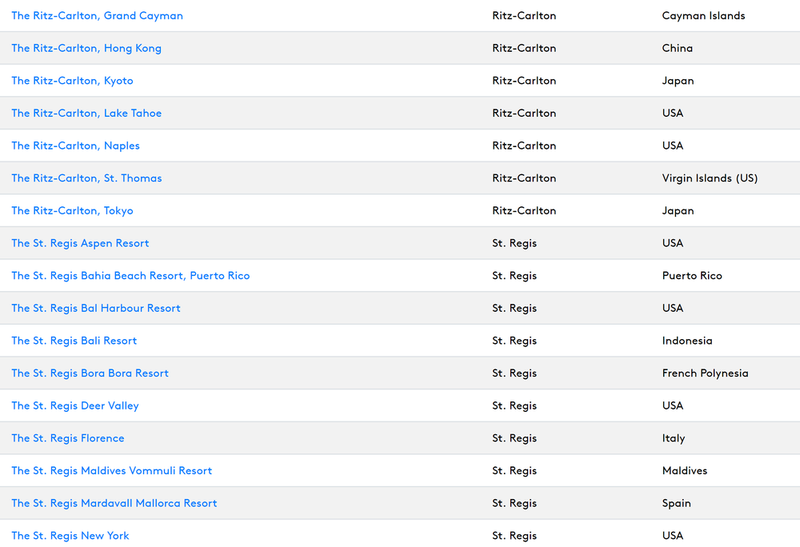 Just looking at the St Regis Bali, I can’t find any available points for 5 nights online, even with flexible dates. Can it be booked online and there are no dates, or do I have to ring to find dates? You need to use the SPG app currently to book SPG Cat 7/8 all suite properties as the website directs to the old website with no availability. Also if you don’t have the points in your account it will also keep trying to direct you to the website. Can confirm it’s possible to book this on points. Do we know the off peak and on peak dates yet? So book now for January and cancel & rebook if it turns out to be off peak? So if I book an original Marriott hotel now without the points is my rate locked in at the current rate? So if it 60,000 today for travel next August and I don’t have the points until say March will i get the rate I booked it at today? No, it seems not (unless it is all some Marriott IT error post merger). Sorry Rob – are you saying that if I want to get the 60k rate on what will become a category 8 property then I need to book before 2019 and also apply the full points to ‘pay’ for it before 2019? That is the current position, yes. However … I mentioned this to the head of Rewards for Europe at the Frequent Traveller Awards last week and it was the first he’d heard about it. He even made a note of it. Perhaps it is a mistake? Is 50k the max points you can buy? I thought it was more under SPG? I’m trying to book, using my cat1-5 7 day travel certificate bought before the merger, an ex-SPG property (new category 4) for May 2019 – Marriott Rewards phone line transfered me to SPG, and SPG’s saying my travel certificate is not valid for SPG properties…. What’s going on? Does anyone have this issue? 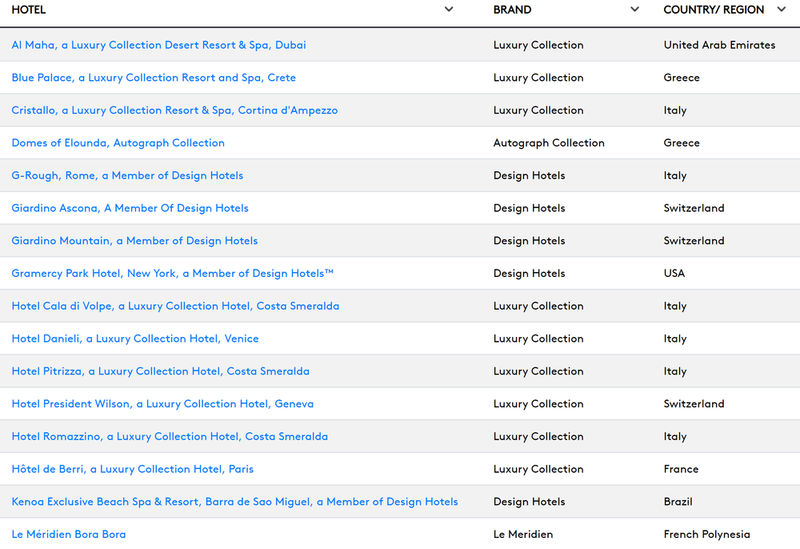 It’s almost a week after Sept 18th, and I want to firm up my travel plans…..
Travel packages can’t be used on ex-SPG properties other than Four Points, at this stage. Another reader recently emailed with the same issue. Told them to call back, they did, and they are now sitting on a nice St Regis Maldives booking. That’s interesting – was that post 18 September?